This recipe idea came from a wonderful food blog http://www.Lemonsandbasil.com. I altered it and added more cheese. The recipe calls for 2 cups but you can use as much or as little as you want depending on how cheesy you like your casseroles. I am not here to judge. I LOVE cheese. Preheat oven to 375 degrees. Cut squash in half lengthwise, remove all seeds and place on baking sheet face down. Bake for 40 minutes or until tender. Meanwhile, heat the olive oil, add the onions and cook over medium heat, stirring occasionally until they are golden and caramelized – about 20 minutes. 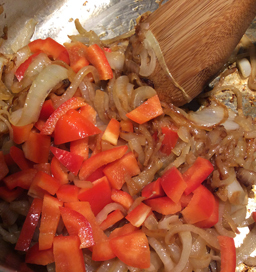 Add red pepper and cook until tender. 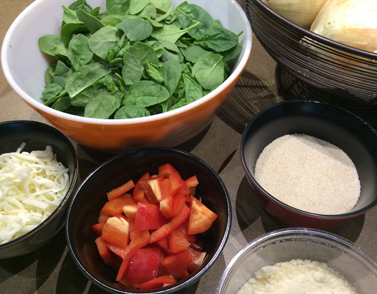 Add spinach and continue cooking another 2-3 minutes, or until spinach is cooked and wilted. Remove from heat. Once squash is cooked and cooled, use a fork to shred flesh into large bowl. At this point, increase oven temperature to 400 degrees. Add egg, Greek yogurt, chili flakes and half of bread crumbs and Parmesan cheese. Season with salt and pepper and stir to combine. Stir in the Squash mixture until combined. 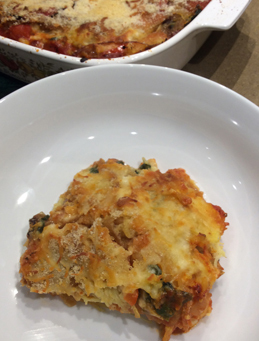 Pour 1 cup spaghetti sauce into 2 quart baking dish. 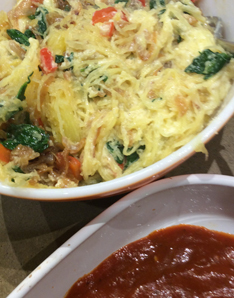 Next, spoon spaghetti squash mixture over sauce and spread evenly. Sprinkle with 1 cup of Mozzarella cheese. Add another cup of spaghetti sauce, spread evenly then top with 1 cup mozzarella cheese, parmesan cheese and remaining bread crumbs. Sprinkle smoked paprika over the bread crumbs. Bake at 400 degrees for 20-25 minutes, or until lightly browned. 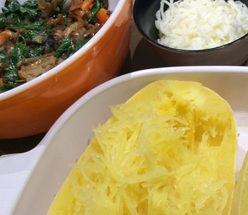 This entry was posted in Uncategorized and tagged Italian, Spaghetti Squash, Spinach, Vegetarian. Bookmark the permalink.